Whatsapp social media chat officials, has been rolling out lots of features to their platform for sometime now and some of these updates made on this chat app are as follows; Whatsapp video call, voice call, group link for inviting people and lots of more. But recently, they updated whatsapp with a feature called Video Status. 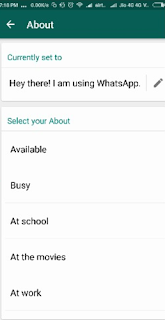 This feature, as complained by many, didn’t suit what they want in whatsapp. You can read more about that here. Video Status was introduced to replace the traditional text status, which took effect immediately as of then. But users, complained about the video status, that they prefer text status to video status. Meaning they want it back to the platform instead of having the video status feature. 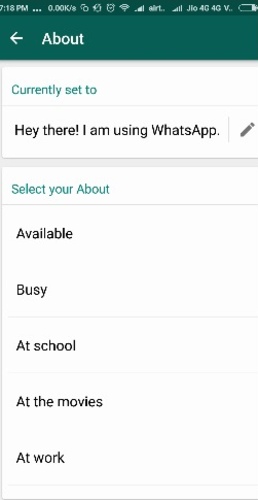 So Whatsapp having heard the complaints of its users, decided to bring the text status back to the platform. Although, the feature has been out for a while now, but it was updated for beta users. And now, it is available for all users. In case if you haven’t received the update on your own whatsapp yet, you can proceed to App store and get yours updated. This is an official update from Whatsapp, so endeavor to get yours updated in order to enjoy the feature.